A good auctioneer can make all the difference! David has long experience of running auctions. Whether for a professional auction house or a charity David is willing to consider it. David is also happy to act as compere or Master of Ceremonies and would be fully committed to making your event a great success. 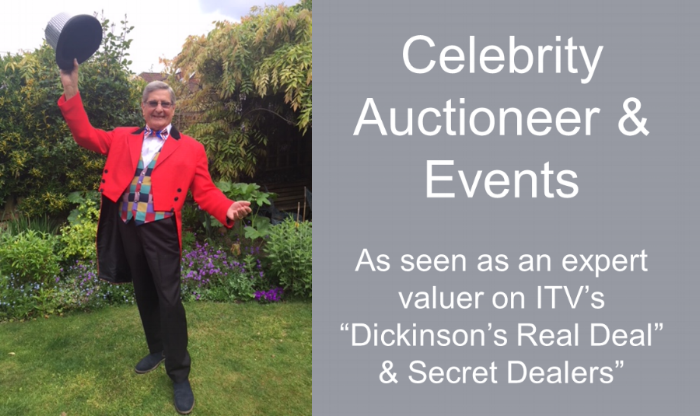 Valuation events- Raise money for your favourite charity! David is pleased to participate in valuation events which can prove a very profitable way for charities, clubs, schools and other organisations to raise money. This can take the form of an `Antiques Roadshow`-style event whereby David could come on his own or organise a panel of experts. Alternatively, items could be brought which David would value and/or comment upon for the benefit of the whole audience. David would also be happy to attend a group/society evening when he could give a talk about his life (which has been colourful to say the least!) his experiences in the antiques business and, most recently, his television work. The talk would be tailored to suit the needs of the audience from academic to light-hearted.